Why Lord Ganesha is Worshiped First? Interesting question, right? Let us explore the answers from different view points. 1. The Vedic Perspective: It all begins with Lord Ganesha! Lord Ganesha appears even before the creation of prakriti(nature) and purusha(consciousness). This is a very important mention in our Scriptures that links Lord Ganesha with commencement of any task. He appeared before beginning of important task like creation of the world! This is means he is eternal and presents himself to remove any obstacles during the process of creation. In India, Lord Ganesha is prayed before starting almost any work. He is worshiped first in all rituals in almost all streams of Hinduism, e.g. Shaivaites(Shiva followers), Vaishnavas(devotees of Vishnu), Shakteyas(worshipers of Shridevi) and others. In fact, Lord Ganesha has become synonymous with the beginning. You can often hear people in India saying – “We will do Shri Ganesha of that work soon”. This means that they are going to begin the work immediately! You may be wondering now: what is the strange nexus between Lord Ganesha and beginning of the work? OK. Let us understand it some more! 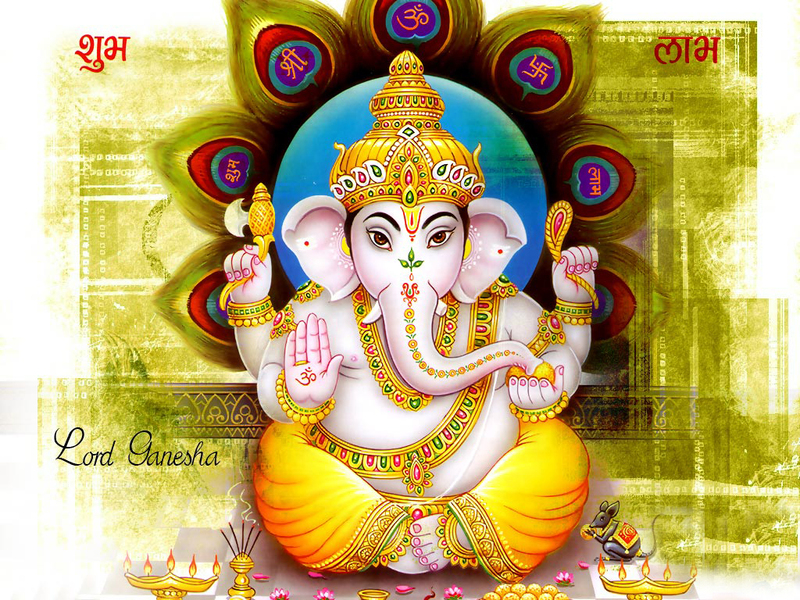 It is described in the Scriptures that Lord Ganesha is the ruler and remover of all obstacles. So, he has another name: Vighneshwara, the lord of obstacles. In his capacity of ruler of obstacles, he is both Vighnakarta (creator of obstacles) and Vighnaharta(remover of obstacles). We always wish to complete our work successfully without any obstacles or hitches. Don’t we? So, we need to worship Lord Ganesha for his blessings right in the beginning of all our works. Let us look at another reason from yogic perspective. Just think about it. Anything we do must fall into one of the two categories: material or spiritual. As we discussed earlier, Lord Ganesha rules muladhara chakra in our psychic body. Muladhara is the interface between material and spiritual worlds. This suggests that Lord Ganesha controls everything in both these worlds. So, his Grace is crucial in the material world(Earth) and beyond(spiritual world). In other words, he is the giver of material enjoyment on the Earth (bhoga) and liberation (moksha) from endless birth and death cycle. He gives the fruits of all our works or actions whether they are material or spiritual. This is the esoteric reason why we should pray Lord Ganesha, before we start any endeavor and to achieve success without any obstacles. According to Tantras, during the creation of our body and mind mechanism, Mother Kundalini starts her creation from the top chakra Sahasrara. She finishes her creation process at the bottom most chakra Muladhara and starts sleeping spiritually so that we(or our Individual Self) will be functional in the material world. So, our material life starts from Muladhara chakra, controlled by Lord Ganesha. In Kundalini yoga, a Realized Master awakens the Mother Kundalini to initiate a worthy disciple to undergo spiritual transformation to experience complete realization by merging with the Universal Self. Therefore, our spiritual journey also begins at Muladhara chakra ruled by Lord Ganesha. Thus, introduction of ourselves to both material and spiritual worlds first happens at this strategic interface of Muladhara chakra. Lord Ganesha rules this chakra. By now, we have clearly understood that Lord Ganesha is the ruler of obstacles and muladhara chakra. If we need to complete any task successfully, we need the Grace of Lord Ganesha in advance. So, he is the important deity to be worshiped first before we begin any work, may it be material or spiritual. We hope it is crystal clear now! Before we conclude, let us remember to pray Lord Ganesha first, i.e. before we begin any work next time! OK? I pray that Lord Ganesha! May Lord Ganesha shower his kind Grace on all of us! Secrets of Lord Ganesha and his trunk: What is the symbolism? Lord Ganesha: What makes him special from yogic perspective? Shridevi Kundalini is both Mahamaya and Mahadevi. This entry was posted in Hindu Deities, Lord Ganesha and tagged ganapathi upanishat, ganapati upanishat, lord ganesh, lord ganesha, muladhara, obstacle remover, psychic body, root chakra, ruler of obstacles, why lord ganesha worshiped first, why lord ganesha worshipped first. Bookmark the permalink.